I got an email from RS this morning saying that they were waiting on an order of ABS to arrive, so I really have no idea when I'll get my box, but I'm looking forward to that day. I should have most of the tools I need already, though a belt sander is on my list. Great news, Andrew. I’m sure you won’t be disappointed when your kit arrives. You probably have already, however, I’d suggest having a peek at some RS builds and Centurion applications whilst you wait to give you a taste of how awesome the kits can look and what’s required. And regarding the 501st, I’ve been trooping with the 501st UKG since March this year and couldn’t recommend it higher! This is great, and a great first step to your finished build. 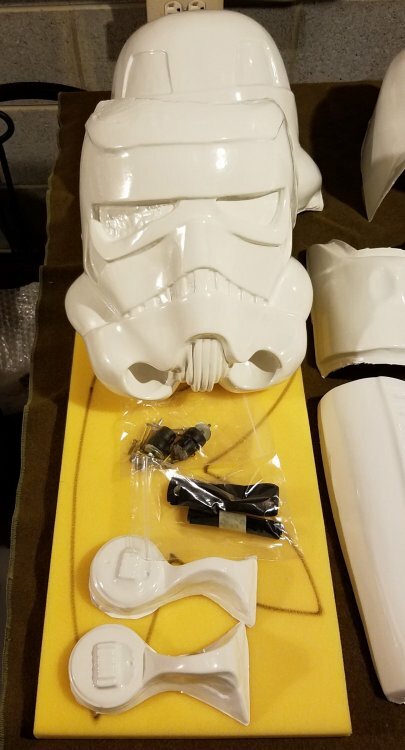 If I may, you should head over to www.501st.com and read up on them a little. But for a quick rundown, we are a world wide costuming group that has movie and reference accurate costumes from the Star Wars universe. We are recognized by LucasFilm to have such accurate costumes and are often recruited by them (Disney) for promotional events. 501st Legion prides itself in being giving! We assist everyone we can in raising money for charity. We do things like Star Wars related "Make a Wish" foundation, Visit hospitals, and show up to premier events for new Star Wars movies. The 501st is so much more than Cons and is currently sitting at 13,481 active members with 26,076 approved costumes. I have only been apart of the Legion since June, and can tell you the feelings I have gotten over the events we have done is simply amazing. Seeing those that don't get to see anything other than the inside of a hospital rooms face light up when they see us is next to none. Having grown adults absolutely flip when they see you is great. The smiles and joy the 501st brings to people is something I wanted to be a part of for a very long time. Hopefully I have at least peaked your interest and have pushed you to look into it a little more. Getting to know your local Squad/Garrison can be a huge help when you need some hands on assistance during your build. Congrats on your RS purchase! The team at RS Props has incredible customer service. You won't regret this purchase for sure. You will love this suit. I'm in the process of starting my second RS TK build. 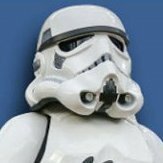 Like you, I began my journey as just wanting to look cool as a stormtrooper. Then I discovered how amazing the 501st Legion is as an organization. And then I found out how supportive everyone here at the FISD is. And then I began trooping and met everyone in my garrison... and so on, and so on... It's a rabbit hole of costuming, Star Wars, family, and community. You will have a blast on this journey!!! Kudos for aiming for Centurion right from the start. It isn't all that difficult to build to Centurion specs, and you will end up looking your best in your armor. We're all here to help you get there! Looking forward to watching your build. Thanks for the kind words and info fellas. So I passed of RS’s strapping kit because $130 for some straps seemed silly. Turns out that also includes the canvas belt, hand guards and gloves, which seems an odd thing to make part of the strapping kit but now the price makes more sense. I’ll have to source those elsewhere, which is fine as I’d like something a little friendlier than the solid rubber gloves. I’m still a ways off from having to worry too much about that yet. Daniel is correct on this! Rubber gloves with silk liners are the only gloves I troop in. They are incredibly comfortable. Daniel is correct on this! I've trooped in 85 degree temps on a sunny day in 80% humidity (trooper life in Georgia) and my hands never felt sweaty. My liners were damp when removing my gloves, but my hands still felt dry. I think you could source all that by yourself for a less. and the "strapping kit" isn't required for any level here. I have snaps and elastic on mine and it will not prevent me from Centurion. Welcome aboard. I always love to see another RS kit come to life. Reading build threads is the key so you know what you're doing before you cut you plastic. Of course you'll still have questions as you go or even just before you start and were happy to help. I Also have an RS kit that I built 2 years ago and it is holding up great and looks awesome. 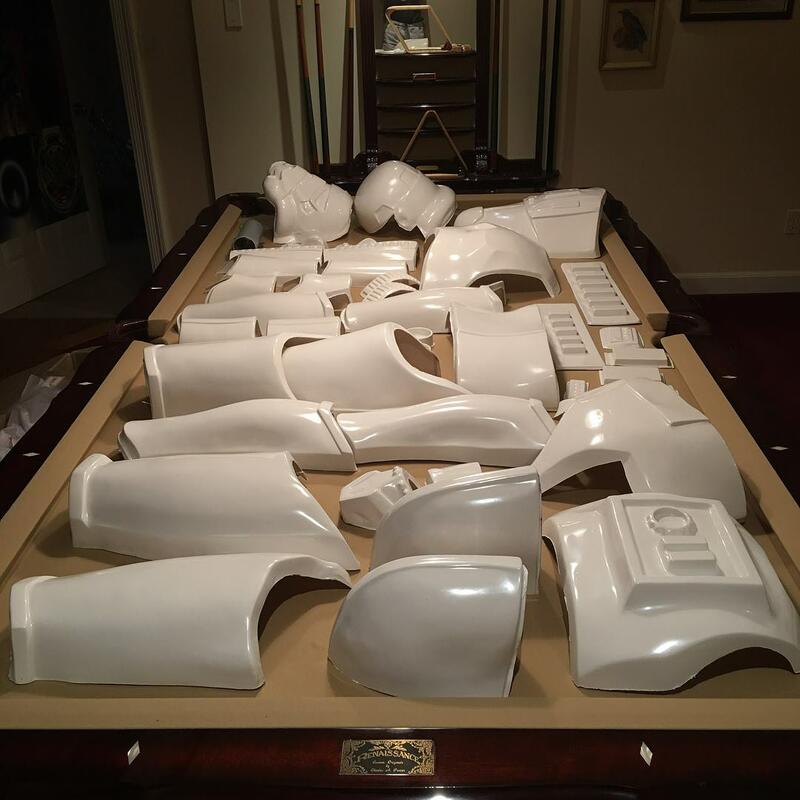 My armor kit showed up today, I laid it all out on a pool table and, unsurprisingly, felt quite overwhelmed with it. There's so many pieces! I'm excited to get started on it, though. It looks good. Unfortunately I appear to be missing quite a bit from the helmet kit. I've got the face mask, and helmet part, as well as the two ears, but that was all I got. I reached out to RS Prop Masters to inquire about all the missing bits, hopefully they won't take too long to reply. Sorry to hear about the missing parts. You should have received a bag with the hovi-mic tips and a bunch of screws and rivets as shown in this pic from my kit. Don't sweat it, you've got plenty to work on while RS send you the parts. Good luck and reach out to us with questions. We're all happy to help. So I'm trying to figure out how the torso pieces go together, and the back plate and kidney plate look really funky. The bottom corners of the back plate are touching the kidney plate. They curve down so the back plate doesn't have a flat bottom. Am I correct in thinking I need to cut the corners off completely so the bottom of the back plate is flat? I don't see how it'll ever sit flat against the kidney plate if I don't, but it seems odd that they would be designed this way if those corners weren't meant to be there. Don't trim anything until you after strapping everything. I thought the same thing, but that is fine how it is now. No you do not need to cut anything yet. What you need to do is a test fit. Have the parts on you body, use painters tape / masking tape to hold the pieces in place and take some pictures (you will need someone to help you with this). Look at those pictures first, then you will have a far better idea where to cut or where to shim. When things do not fit, it does not necessarily means you have to pull a knife, sometimes hot water bath and hair dryer can help do the trick (test with a piece of scrap plastic first!). So I'm a thin dude. 5'9" and 120lbs. I don't expect my height to be much of an issue but my weight might. I'm very thin and the limbs might need some mods. I haven't even got to that point though. Just trying to get the torso to fit first. I don't know how to strap this with things appearing to misalign so much right off the bat. Well that is what you want to do get everything fitted first. Work out where you need to take things in and go from there. Height wise you should be fine. Where you will probably need to trim is your circumference.